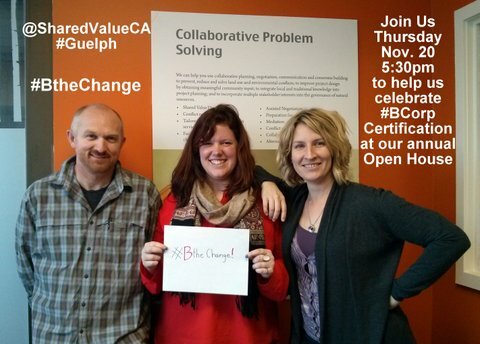 Help Us Celebrate Becoming an Ontario BCorp: One of the First! Shared Value Solutions was certified as a B Corporation (aka BCorp or B Corp) this year - this means we are now officially part of the growing movement of companies using the power of business to solve social and environmental problems. We are one of the first BCorporations in Ontario, and Canada! Please join us in celebrating this Ontario B Corp achievement! We hope you'll join us for some good food, good drinks and great conversation. Businesses and organizations are made up of people. So are communities. Imagine a world where people in industry and government, and people from towns of all sizes, get together to make amazing things happen – things they couldn’t have dreamed up alone. A world where people from corporations get together with people in government or NGOs to explore innovative ways to do business while enhancing the natural and social environment. Join us in Creating Shared Value! At Shared Value Solutions, We speak your language. And we know that the impossible is possible – with the right people in the circle.